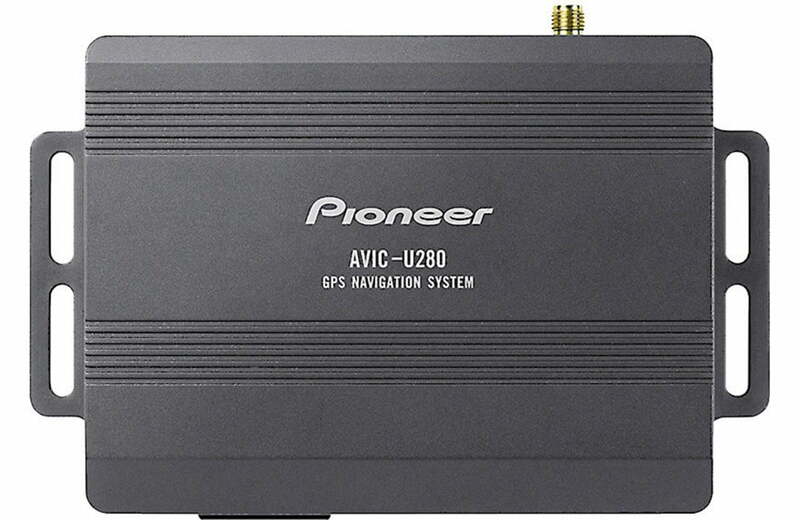 Pioneer AVIC-U280 offers a comprehensive map database from HERE covering the entire United States (including Alaska & Hawaii), Canada, and Puerto Rico enabling users to route to millions of destinations; including 8 Million points of interest (POIs). The map database is stored on the in 8GB SDHC memory card (the SDHC memory card must remain installed in the unit). Map updates via a SD/SDHC memory card will be available at later date. Car navigation maps are frequently updated. While this database was judged to be as accurate as possible at the time of its release, a map database can never be 100% accurate. Road information that is maintained in the map databases, such as turn restrictions or road names may change over time. The unit has a built-in GPS receiver and comes with a magnetic GPS antenna. The AVIC-U280 accurately measures your current location by the Global Positioning System, a network of satellites orbiting the earth to give you time and position information. The accuracy of the GPS information depends upon how good the reception is. The GPS antenna can be installed outside or inside the vehicle. Partnering with Clear Channel Broadcasting’s Total Traffic Network, the included Traffic antenna provides real-time traffic data for over 90 major cities in North America, including US and Canada. Check your commute route in advance or re-route to your destination to avoid traffic congestion. There is no subscription cost and no annoying on-screen advertisements. Road segments affected by traffic incidents are displayed with an alternate color on the map and small symbols above the road show the nature of the incident. When traffic information that may affect your route is receive, this system will warn you that it is recalculating the route and navigation will continue with a new route that is optimal considering the most up-to-date traffic conditions. On-Screen Map: The Pioneer AVIC-U280 displays a real-time moving map illustrating your current position and intended route on your compatible Pioneer AVH-series receiver. It will show map scale and geographic details such as lakes, rivers, highways, buildings, and towns. Your route is marked with a green line, while your vehicle is indicated by a red arrow on the screen, and checkered flag marks your destination. As you travel the AVIC-U280 guides to your destination with arrows on the map and directions at the top of the screen. The map screen will also indicate the distance to your next maneuver. During your calculated route, distance to your final destination, timed need to reach the final destination, and estimated arrival time are all displayed on-screen. You can adjust the following map settings. The Pioneer AVIC-U280 allows you to view its on-screen map in a 2D (two-dimensional) or 3D (three-dimensional) view. 2D View displays a normal two-dimensional map with North or your direction at the top of map screen. Similar to paper road maps, the 2D mode, shows you streets, roads, and elevation by color. In 3D mode, your direction is at the top of the map screen and you can see the altitude and elevations differences. You can distinguish between valleys, mountains, and elevated roads. In selected cities 3D landmarks and 3D buildings are also displayed. You can switch between daytime and nighttime color modes or let the unit’s software switch between the two mode automatically a few minutes before sunrise and a few minutes after sunset. The on-screen map offers Smart Zoom. When you approach a turn, the map will zoom in and raise the view angle to let you easily recognize your maneuver at the next junction. If the turn is at a distance, it will zoom out and lower the view angle to be flat so you can see the road in front of you. The Pioneer AVIC-U280’s navigation map offers helpful lane information and signpost guidance, along with exit service. When navigation on multilane roads, it is important to take the appropriate lane in order to follow the recommended route. If lane information is available in the map data, the map screen will display the lanes and their directions using small arrows at the bottom of the map. High lighted arrows represent the lanes you need to take. Junction View: If you are approaching a freeway exit or a complex intersection and the needed information exists, the map is replaced with a 3D view of the junction. The lanes you need to take are displayed with arrows. Signposts can also be present, if information is available. Exit Services: While navigation a route, you can find gas, food, lodging, and restrooms near upcoming exits along major highways and freeways. Tunnel View: When entering a tunnel, the map is replaced with a generic tunnel image so that surface roads and buildings cannot distract you. 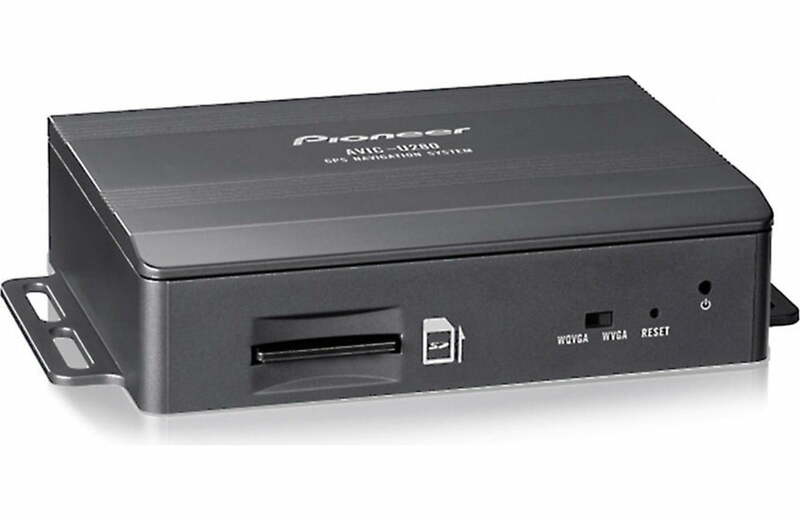 Audible Alerts: The Pioneer AVIC-U280 offers various audible alerts and functions to help you get to your destination safely. In addition to graphical on-screen directions and maps, the AVIC-U280 provides voice guidance and turn-by-turn directions. You can choose a male or female voice in English, French, or Spanish. Some of the voices are capable of text-to-speech, announcing the street names along with the turn directions. You can adjust the the AVIC-U280′ voice guidance volume independently from the compatible Pioneer head unit’s main volume. Safety Alert: This function can warn you when you approach road safety cameras, school zones, or railroad crossings (if available). You can also add your own alert points. Beeps or the spoken type of alert will be heard when you are approaching of these points. Speed Limit Warning: Some maps may contain information about the speed limits of certain road segments. The AVIC-U280 provides an audible warning if you exceed the recommended speed limit. The unit will mute the audio of the other sources during navigation voice-prompts. The Where Am I? screen contains information about the current position (or approximately the last known position if GPS reception is not available) and a button to search for POIs and emergency assistance nearby. The Destination Search menu offers search tools to find your destination and play your route. Select a point on the map for your destination by touching the screen. Address: Input your destination address by house number, street, and city (or county). Search over 7.9 million POIs (points-of interest) by name, near you current location, near your destination, or around a city. Favorites (including Home & Work): You can save your favorite addresses and POIs for quicker access the next time you are traveling. You can also save your Home and Work address in your favorites. The places that you have set as destinations in the past are automatically stored for easier access. Smart History suggest these previously used locations as destinations based on your navigation habits, using parameters like the current time of day, the day of week, and the current location. You can enter search keywords to find addresses, favorite places, recent destination, and POIs. Coordinates: Allows you to search your destination by longitude and latitude values. Your vehicle must be stopped and the parking brake will need to be engaged to enable certain navigation functions; such as Address search and Coordinates. Route Calculation: The Pioneer AVIC-U280 calculates your route based on your Vehicle Type, Route Method, and Avoidances. Vehicle Type: You select what type of vehicle you are driving, so the navigation unit can determine the best route based on your vehicle type (Car, Truck, Emergency, Bus, or Taxi). You can choose which route method (Fastest, Shortest, Green, Economical, or Easy) the navigation unit should use when calculating your route. Avoidances: You can tell the navigation unit to avoid certain types of roads along your calculated route, such as – Highways, Tolls, Carpool/HOV, Unpaved Roads, and/or Ferries. Route Planning: The Route Planner feature lets you built your route using the list of destinations you have chosen. You can modify the list as you like (adding or removing a destination (waypoint), changing a final destination, or setting a new starting position. The Itinerary page displays turn-by-turn instructions for your entire route and the distance between turns. You can preview all the route information and simulate travel along a projected route. Compatibility: The Pioneer AVIC-U280 Add-on Navigation System is compatible with the following 2010 and up Pioneer AVH-series navigation-ready multimedia head units. Modifying Route: You can select “Route Alternative” to see the turn-list and map screen of four routes (Fastest/Shortest/Economical/Easy) with the selected route planning parameters, giving you the option to select which route to take. You can also choose to Detour around the road ahead, avoid a specific road, or around a section of the route. If you depart from the original route, the navigation system recalculates the route and provides new directions. The Trip Monitor contains useful information about your trip. This information can be saved manually when you reach your destination or automatically along your route. Trip log data includes; Start/End Time, Avg./Max. Speed, Total/Driving/Stopped Time, Total Distance, and Min./Max. Altitude.